These flights all had been cancelled as of midnight Wednesday. But the number of cancelled flights rose quickly, and it appeared all flights between Europe and Thailand would be grounded. Swiss Airlines also cancelled its scheduled flight to Zurich. 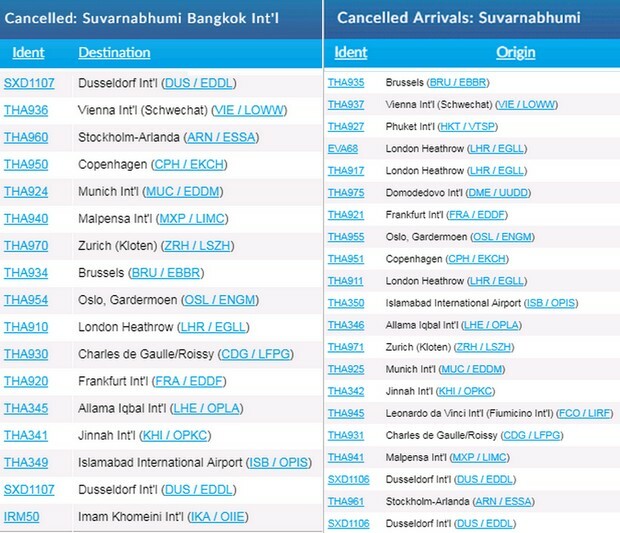 Flights from Europe to Thailand were almost certain to be affected as well. The flight cancellations also will affect other airports in Southeast and East Asia. Thai Airways International president Sumeth Damrongchaitham described the situation as an emergency and called an urgent meeting of top airline officials. He said one obvious stopgap measure was to change the routing of flights between Thailand and Europe – not a trivial task. As of Wednesday afternoon, the Indian government also closed its country’s airspace over parts of northern India, according to Rakesh Asthana, the director general of the Bureau of Civil Aviation and Security. It was not immediately clear if that would also affect air traffic between Europe and Thailand. THAI cancelled all three of its scheduled flights to Pakistan on Thursday, and Iran's Mahan Air announced the cancellation of its flight from Bangkok to Tehran. Earlier on Wednesday, the Thai embassy in Islamabad had issued a travel warning that advised all Thai travellers to avoid trips to Kashmir, the epicentre of the India-Pakistan dispute and military clashes. Brussels-based Eurocontrol, which coordinates the airspace of 41 nations, told airlines in a bulletin that Pakistan’s airspace was closed “with immediate effect”. The airspace closures came as the two countries reported sharp clashes including the reported downing of two Indian warplanes inside Pakistan. Tension has been elevated since a suicide car bombing by Pakistan-based militants in Indian-controlled Kashmir killed at least 40 Indian paramilitary police on Feb 14. 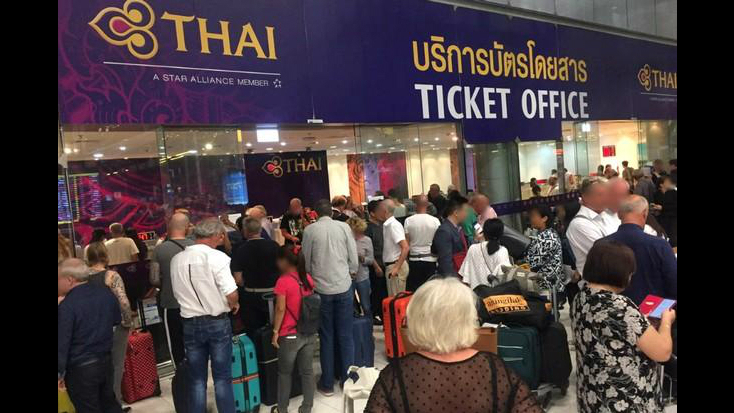 Other airports including Phuket and Don Mueang, also were affected, and all passengers in Thailand booked on flights heading west are advised to check their flight before heading for the airport on Thursday.